Destroyit Paper Shredder Model 2465 - Technology Unlimited, Inc.Technology Unlimited, Inc. The MBM Destroyit 2465 Cross-Cut Shredder can shred up to 15 Sheets of 20 lb paper into 3/32″ x 5/8″ cross cut particles. Containing a 9 gallon capacity shred bin that can be easily removed for quick disposal of shredded materials. 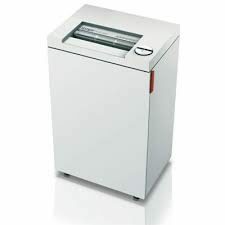 Additionally; this shredder has an automatic reverse and power cut-off capabilities that avoid paper jams and automatically stops when the shred bin is full. The 2465 is ideal for shredding paper clips and credit cards.